Learn how to make a pretty origami cherry blossom flower, these traditional Sakura flowers make wonderful decorations for many occasions, decorate handmade greetings cards or use as wall decor! This origami flower starts off by making a pentagon which is what gives it fiver petals! It is recommended to start with paper that is 15 x 15 cm. You can then make them with smaller paper once you have got the hang of it. 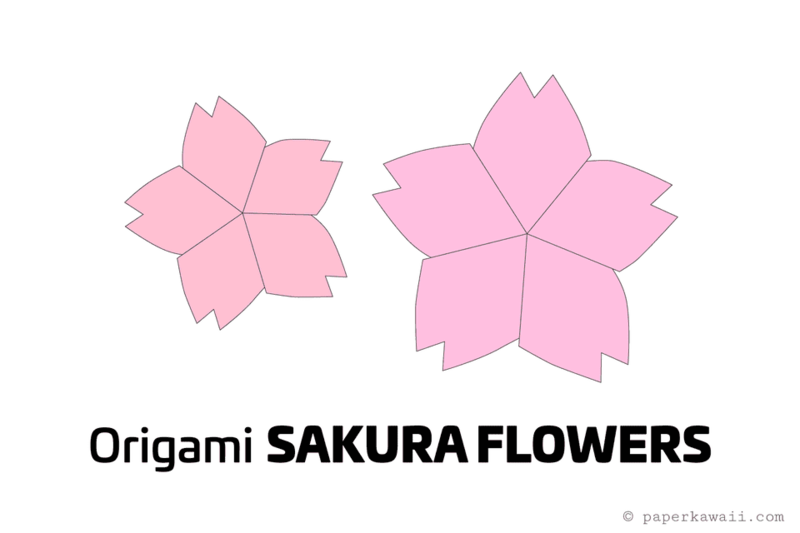 It is required that you cut the paper to make the pentagon, at which point you instead give the petals their shape by cutting which could make this origami a more '​kirigami' style DIY. 1. Fold the bottom edge of your paper up to the top. 2. Next, take the bottom left corner and bring it up to the center—do not crease the whole section just the middle point. 3. Bring the top left corner diagonally down to the middle and again—just make a pinch at the center. You will now have an X marking the center of the left side of the paper. 4. Bring the bottom right corner over to the center of the X and crease. 5. This is what you should have. 6. Now you can fold the flap over to the right, aligning with the vertical edge of the right section. 7. Next, take the bottom left corner and fold it up and to the right, aligning it with the left vertical edge of the right section. 8. Fold the whole of the left section behind, folding along the same left vertical edge. 9. Now you can cut a petal shape as shown, you can get different results by making the petal shape different. 10. Carefully unfold the paper. You should be looking at the colored side of your flower. 11. Now you need to refold the flower, making sure that the creases that are in between each petal are valley folds. The folds that are in the center of each petal are to be mountain folds. Tip: Valley folds are when you fold the paper like this V and mountain folds are like this ^. 12. Fold the bottom left edge inwards a little. 14. Flip the model over to the other side. Fold the bottom left section in a little - the same amount as the other side. Tip: This will not look neat and it won't matter, flowers are not symmetrical! 15. Carefully unfold the flower—bring the petals from behind down. Pull the top section out to the right, at the same time, hold onto the little square, lifting it up slightly. 16. Flatten out the flower. Start twisting the point in the center in a clockwise motion. 17. Carefully start flattening out the center, use your finger to gently push the center. It will become a flat pentagon. Your little pentagon might not look great the first time you make it —after some practice, it will look more perfect. 18. Flip the flower over to the other side and you origami cherry blossom is complete!